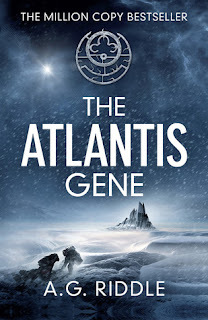 I have to admit, I skimmed large chunks of The Atlantis Gene by A.G. Riddle, which actually didn't hinder my understanding of the plot and action very much at all. So the story wasn't hard to follow despite some critiques by other reviewers that the major players and opening scenarios melded into a confusing haze. My advice is to just blast through those details until it straightens itself out. Which translates into: there was just too much storytelling and extraneous details for my taste. Now, I don't like bare bone plot novels but neither do I care for the sprawling adventure that gets unwieldy from near the start (which this novel got precariously close to doing, imo). For those who enjoy expansive series with lots of characters, storylines, subplots, and short chapter interludes, this may be right up your alley. Especially since there's a lot of great stuff in this book. Unfortunately, for me, I endured the first 75% so I could enjoy the last 25%, which was pretty fast paced and exciting (like a lot of books, truth be told). The challenge, though, is this novel doesn't reach a conclusion. I knew this was book one in a trilogy, but it's actually only part one of the story. There's a difference. The Hunger Games was book one. Catching Fire and Mockingjay were parts 1 and 2 of the sequel. See what I mean? The Atlantis Gene is an intriguing alien/time-travel/conspiracy theory adventure, but it didn't satisfy my expectation of a complete story. Now I say all this knowing this book is a phenomenon in indie publishing and commend the author for meeting multiple thousands of readers' needs. It just goes to show that a fairly good story told fairly well (which is what 3 stars means to me, and how I'd rate it) is enough to please plenty of a writer's fans and keep them coming back for more. Recommended for indie book lovers and sci-fi apocalyptic lovers.